I have been diving quite a bit during the past few months. Like most divers I met, I log my dives in a small booklet, a dive log book. Many dive shops sell their own dive log books, usually at around US$5-10. The motivation for creating my own dive log book is not so much the cost, but the content. By creating my own dive log book, I can decide what information I want to log and make optimal use of the space. Using LaTeX, I created a dive log book template. I provide the following code/PDF as is, without further explanations. 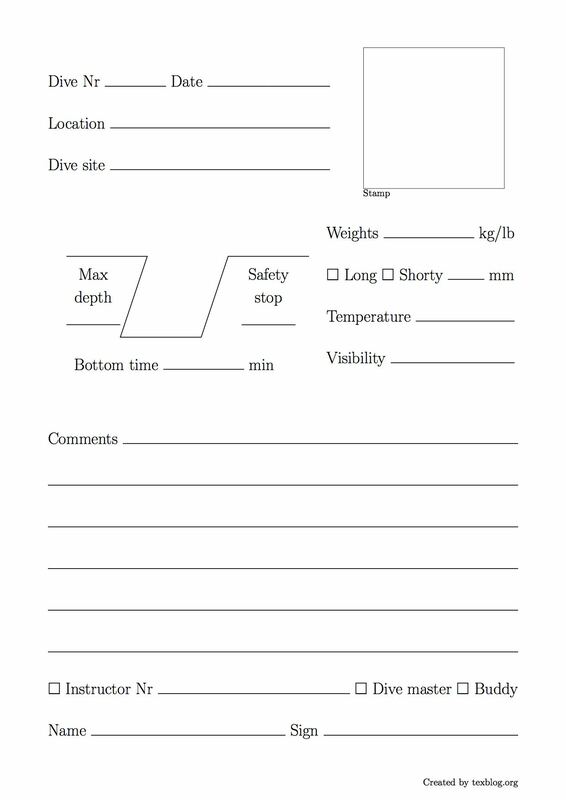 The template contains all information I would personally log after a dive. Feel free to use and /or modify it to create your own custom dive log book. If you are not familiar with LaTeX and would like to make minor changes, drop me a comment below and I’ll try to help. Link to dive log template created with LaTeX. For an A6-sized dive log book, I created an A4-sized PDF that contains four copies of the dive log template. This was done using the pdfnup command on Linux/Unix and Mac. To create your own dive log, download the PDF below (dive_log.booklet.pdf) and print it using an A4 printer (duplex/both-sides and long-edge binding). You want to print 5-10 copies, which would allow you to log between 40 – 80 dives. Cut the pages horizontally, stack all the sheets and staple or bind them. Don’t forget to design and add a booklet cover, ideally using a stronger/thicker paper. You could use a picture from an old dive magazine for example. I can also add a letter-sized template if that’s any useful. Just let me know below. Dive log for printing: dive_log.booklet.pdf. Please consider buying me a coffee if you found this tutorial/template useful. Thanks a lot for letting me know. It’s a HTML issue, the code is not properly displayed on my blog. So for now I just link to a source file. Feel free to add it to your gallery.